Following ancient trade routes, the bicycle route leads from the Tyrolean capital Innsbruck to the Festival City of Verona. Numerous old railroad tracks and dam pathways have been converted into modern cycle paths. Therefore, you can enjoy the impressive towns and mountain views almost without being disturbed by any traffic. The great cities of Brixen, Bolzano, and Trento provide some cultural highlights on the way! The landscape at the Brenner Pass at 1,370 meters of altitude appears almost alpine and in Brixen, orchards and vineyards dominate the natural scenery. At the Salurner Klause you will enter the "real" Italy with its Mediterranean flora and fauna. On this beautiful bike tour, you will always find a lot of variety - whether nature, culture, or cuisine, this tour has something to offer for everyone! After breakfast, we will take you up to the Brenner Pass (by train or minibus). From the small border town Brenner, you will cycle on a newly extended bike path, mostly along the river Eisack, first to the little village Gossensass and immediately afterwards to Sterzing, the once mighty city of the Fugger. You will continue your tour to Thumberg, to the beautiful Reifenstein Castle, and via Stilfes and Mittenwald to Franzensfeste with its famous fortress. The bike path continues to the beautiful and quiet Lake Varna, to Varna and finally to Brixen, today's destination. Routes on this bike and brewery tour may be subject to change or alteration. All route notes, maps and information for this cycling holiday will be given to you upon arrival at the first hotel or at the welcome meeting. 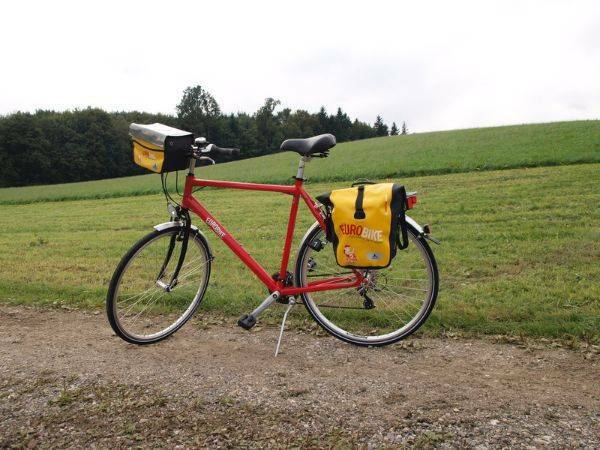 GPS/GPX files are available for most of the cycling holidays we offer. Organisation: Today‘s stage starts with a transfer by minibus or train from Innsbruck to Brenner Ort. Your mode of transport for this transfer will be confirmed at the welcome briefing. The train ride takes approx. 40 minutes. You will receive the ticket (bike included) at the welcome briefing. 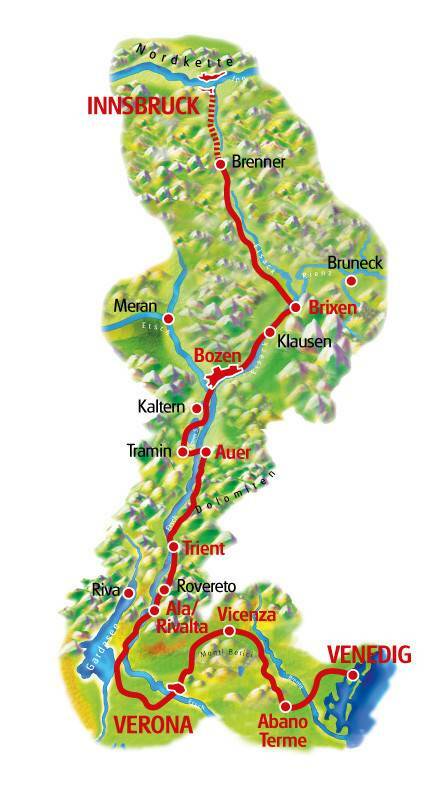 Brixen – Bolzano 40 km From Brixen to Bolzano you have a smooth descent of about 300m in altitude difference. Bolzano – Trento 70 km There are two route options today, a hilly route via Eppan and Caldaro or a flat route along the Adige River. Trient – Ala/Rivalta 45 – 60 km Todays route is entirely on cycle paths. Ala/Rivalta – Verona 50 – 65 km Today you mainly cycle on cycle paths. There is one longer climb of approx. 2.5km before Rivoli. Verona – Vicenza 70 km Today’s stage is about 70km long and with the Berici hills (ascents lasting about 4 and 300m climb), it is sure to be strenuous. There is the possibility to take a train for the first section until San Bonifacio. In addition to the route description, you can also follow the official “l1”bike path signs. Abano Terme – Venice/Mestre 50 km Unfortunately there are some sections in Padua with heavy traffic that cannot be avoided. Mainly flat route. It is possible to drive around Padua: at the 10.2km point, turn right and follow the cycle path along the canal. At the 16.8km point, you will return to the original route description. Please fly to Innsbruck airport to reach the starting point of this Innsbruck to Venice cycling holiday. 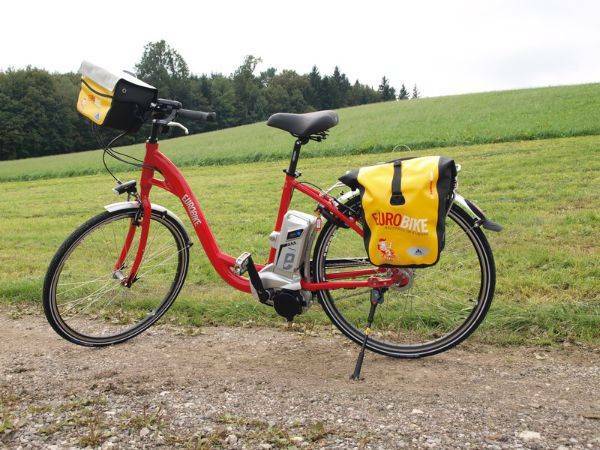 Flights are available with a number of airlines to your required airport, or you can travel to the start of this Salzburg to Passau by bike using alternative methods such as rail or road. Austria Trend Hotel Congress: taxi takes about 5 minutes and costs about €8. Alternatively, it is about a 2 km walk or you can go by bus according to timetable www.postbus.at and get out of the bus at “Haus der Begegnung” which will cost about € 3. Hotel Central and Zach: taxi takes about 3 minutes and costs approx. €7. Alternatively, it’s about a 750m walk. From Innsbruck Airport, the cost per taxi is approx. € 16. Alternatively, you can catch bus “F” to station Hauptbahnhof for Hotel Central and Hotel Zach or further on by bus according to timetable www.postbus.atand exit the bus at “Haus der Begegnung” to Austria Trend Hotel Congress. The distance from the airport to your hotel is about 5 km. 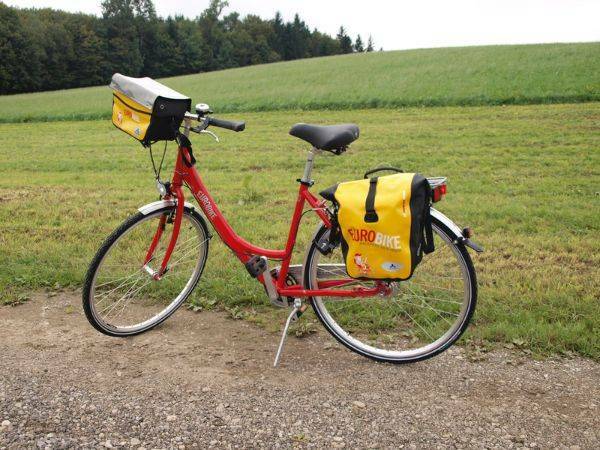 Please use local transport to arrive at the starting point of this Austrian and Bavarian beer tour and cycling holiday or call us on 0800 755 5385 for more specific travel advice. Important: Please book your flights only after the Innsbruck to Venice by bike trip has been confirmed by invoice or email. Flights and transfers are not included in the advertised holiday price. The Innsbruck to Venice cycling holiday includes the daily transfer of luggage to the next hotel and local support if required.